← Why Is The Post 1940 Data Tampering So Important? There has been no atmospheric global warming, at all, for 17 years and 5 months, despite 35% of all human CO2 emissions, since 1751, emitted over the same period. 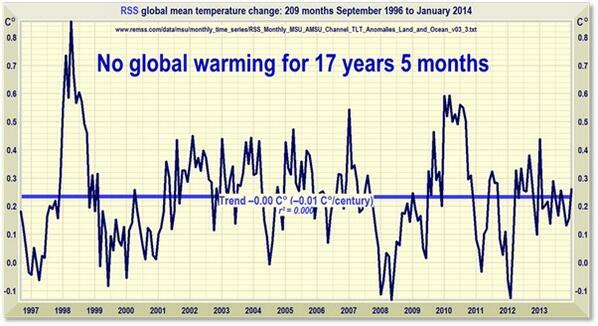 Satellites show no global warming for 17 years 5 months | Watts Up With That? The global warming “pause” has become one of the biggest mysteries in climate science. A thorn in the side of the IPCC and the warmist community who assured us that the atmosphere would warm if ‘business as usual’ greenhouse emissions continued. They were wrong. And their state-of-the-art, billion dollar climate models, which governments base policy decisions on have failed miserably. 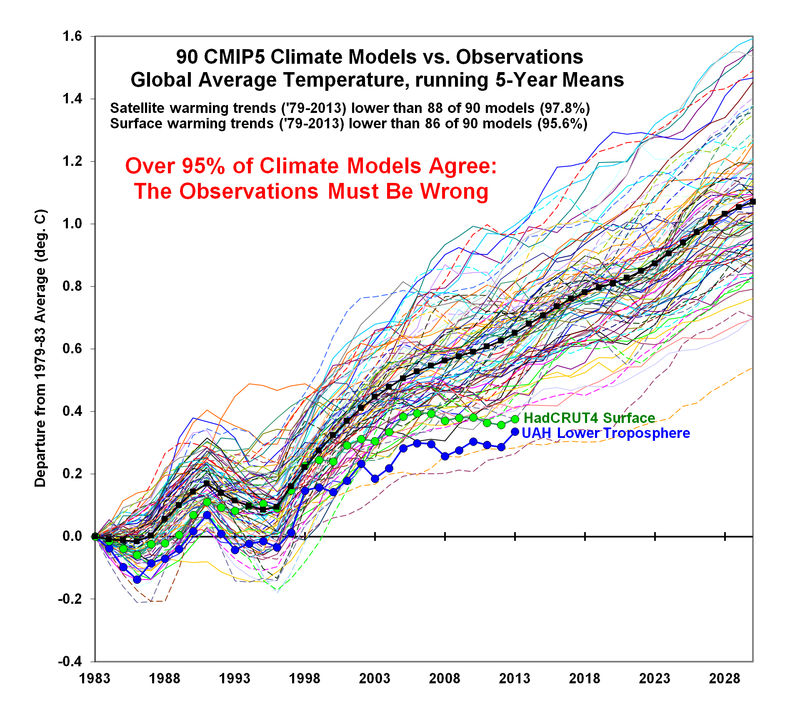 95% of CMIP5 Climate models bear no resemblance to reality and remain scandalously overheated. There have been at least eight separate explanations for the standstill in global warming, with the latest from UNSW Professor Matthew England, claiming “Stronger than normal trade winds in the central Pacific are the main cause of a 13-year halt in global surface temperature increases …”. 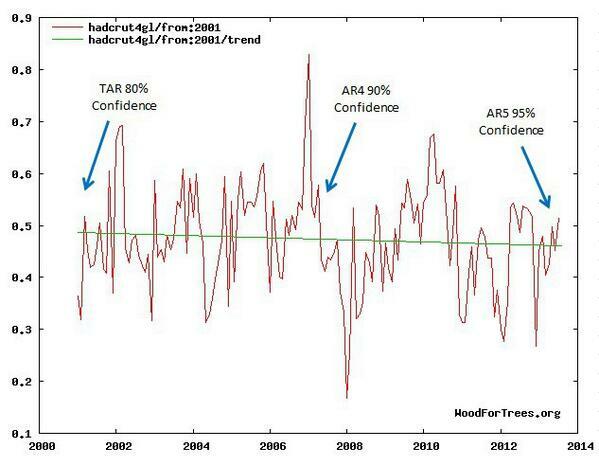 His paper released, three years after he accused sceptics of “lying that the IPCC projections are overstatements”. With no consensus and little confidence as to what is actually driving the current 17 year global warming ‘Hiatus’, how does the IPCC conclude in their latest AR5 assessment report, that they are ‘even more confident’ (95%) that human’s are to blame for global warming that stopped in 1998? Andrew Bolt’s column in today’s Herald Sun, demonstrates how the 95% confidence meme, sounds more like another cleverly worded PR campaign out of the IPCC and warmist community, to promote the cause for draconian emissions controls. YOU would think scientists of the NSW Climate Change Research Centre had done enough damage to their warmist crusade. A month ago, its Professor Chris Turney got his ship of researchers stuck in Antarctic sea ice he had claimed was melting away. “Sea ice is disappearing due to climate change, but here ice is building up,” Turney’s expedition wailed. In fact Turney’s team — planning to examine parts of the Antarctic “highly susceptible to melting and collapse from ocean warming” — apparently hadn’t realised sea ice there had grown over three decades to record levels. Turney’s climate centre, at the University of NSW, sponsored this disaster, which ended with two icebreakers rescuing the mortified professor and his warming crusaders. It’s farce like that which helps explain why the CSIRO reported last week only 47 per cent of Australians buy its spin that the climate is changing and we’re to blame. Australians now rate global warming of “low importance”, the CSIRO sighed, and warmists faced “the challenge of finding the right language” to gee them up. But up bobs another Climate Change Research Centre scientist to show the warmists’ problem isn’t the “right language” but the false hype. Two years ago, Professor Matthew England appeared on the ABC’s Q&A to attack Nick Minchin, the former Howard government industry minister and a sceptic. Minchin had raised a puzzling fact: the planet had not warmed further since 1998. “Basically we’ve had a plateauing of temperature rise,” he said. CO2 emissions had soared, but “we haven’t had the commensurate rise in temperature that the IPCC predicted”. England later even accused sceptics of “lying that the IPCC projections are overstatements”. So imagine my surprise when England admitted last week there had been a “hiatus” and “plateau in global average temperatures” after all. Startled readers asked England to explain how he could call sceptics liars two years ago for mentioning a “plateau” he now agreed was real. What bull. In fact, five years ago the pause was already so obvious that Family First senator Steve Fielding confronted Penny Wong, Labor’s climate change minister. “Global warming quite clearly over the last decade hasn’t been actually occurring,” Fielding said, and showed Wong the temperature charts. Wong and her advisers — chief scientist Penny Sackett and climate scientist Will Steffen — said he was wrong. Journalists mocked him. Except, of course, the warming pause is now so obvious even England now admits it. England now claims those stronger winds somehow drove the missing warming into the deep ocean.